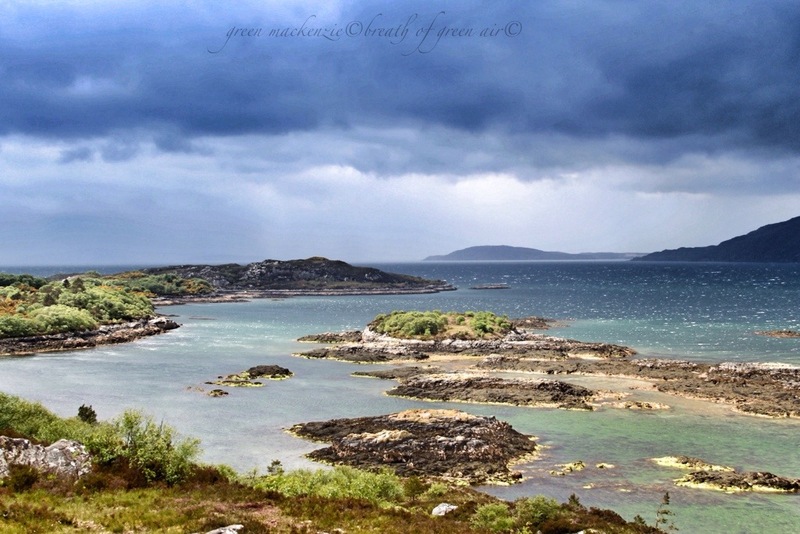 This entry was posted in elemental, photos, poem and tagged Haiku, islands, mindfulness, photography, scotland, seascape, travel. Bookmark the permalink. Thank you, it’s a wonderful spot, at the top of a hill behind our house in Plockton….the views take my breath away every time I climb it….and it looks different each time. Looking out across the Inner Sound towards the Inner Hebrides, and I’m always imagining the Outer Hebrides beyond, washed in Atlantic swell…..
We are so lucky to live on this amazing island we sometimes forget to appreciate it. Thanks for the reminder. What lovely imagery. Sounds quite magical. Thank you Cindy, delighted you enjoyed the combination! It really is…..I could sit and watch this view all day….the eye gets drawn eventually away to the horizon and the far isles…. Beautiful photography + Beautiful verse= Like ancient Chinese landscape painting ! What a lovely compliment, thank you so much. Having a post compared to ancient Chinese paintings is very high praise indeed. Another lovely combination. I envy you all the ‘extras’ you have in your scenes of white horses – ours have a lot less variety! Oh yes, those extras are well worth their fees! It’s one of the things I love about shooting ocean shots up here on the North West coast, compared to our East Lothian beaches there is just so much more interest in the rocks, islands and inlets. I used to sit up on this hill as a child and imagine that pirates were living on these rocky isles! Maybe they are! Who knows? David, I have to confess to artistic license……I just don’t really take photos when the light is flat. However there are exceptions….previous post Stone Wrinkles was shot in flat but bright light…..and that’s great for picking out textural details. Landscapes however just don’t work for me without good light, and preferably some cloud drama…..but again my previous post Skye sized Room was shot on a very, almost too bright, cloudless day, so I waited till late afternoon so that the light would soften and I might get some good shadows! Oh and I do tend to shoot a lot of images, but then just pick a few to process. I’m a greedy guts when it comes to images! Thank you, delighted you enjoyed the combination! Thanks Kellie, this was taken from the hill at the back of the house, and I never get tired of this view…..it’s different each time. Last night it was bathed in pink as the sun set! Gorgeous visualization as always… along with the fabulous picture. I do so enjoy your words and pictures. I’m so sorry I missed your part of Scotland when I was there too as it is so lovely. I do love to be swept away by the motion and energy of the white horses at sea. You will just have to come back and visit a different part! There are so many and all so different it would take a lifetime to fully see them all! Wow, thanks…..what a great comment, so encouraging. The colours in this are magical! Thanks, Seonaid. Thanks Sue, it was a beautiful wild day with splashes of sunlight acting like spotlights on the unfolding sea action! I know, and it’s frustratingly hard to capture that fleeting motion of beauty in a photo…..it took me quite a few shots before I was happy! 5 mins after this the heavens opened and sent me scurry back down the hill looking for cover! They are about to sweep me into the Burren later today. A place I’m sure you will find much inspiration in too! Give me a shout for sure, if you come in this direction one day. Love the verse and the photo! Me toooo even on a cloudy day!